TROPICAL STORM HARVEY UPDATE: Pay attention to the rain, not the wind! Tropical Storm Harvey continues to slowly drift east-southeast in the northwest Gulf of Mexico. Latest surface observations from the northwest Gulf of Mexico indicate Harvey is attempting to get slightly stronger, with winds in some offshore locations gusting above 50mph. But, the system doesn’t look to have much of an opportunity to intensify very much over the next 24-36 hours before it makes landfall in western Louisiana due to the system ingesting a lot of dry air & battling ESE wind shear of 25mph. Minor fluctuation in strength to a moderate tropical storm before landfall isn’t out of the question. The Tropical Storm Watch in effect for Eastern Cameron Parish & Vermilion Parish has been upgraded to a Tropical Storm Warning. This means tropical storm conditions likely within the next 36 hours. Primary wind threat: sustained 20-40 mph with occasional gusts as high as 35-50mph late Tuesday into Wednesday mid-day. All of Acadiana and southwest Louisiana will experience breezy conditions with occasional gusts of 25-35mph on Tuesday and Wednesday. A Storm Surge Watch is in effect from the Louisiana/Texas state line to Morgan City. This means coastal flooding of 1-3 feet is possible Tuesday & Wednesday, especially during high tide as onshore wind flow will allow coastal tides to rise. Keep this in mind if you live in a flood-prone location near the coast. Most of Acadiana has received 4-12+” of rain over the past 3 days, which means soils are saturated. The Vermilion River, Mermentau River, and Bayou Vermilion are now in minor or action flood stage. Pay close attention to the weather situation tonight through Thursday. Flash Flood Watch remains in effect for all of Acadiana until 7PM on Thursday. The Weather Prediction has placed all of Acadiana south of I-10 within a HIGH risk for excessive rainfall tonight and most of Acadiana within a MODERATE risk of excessive rainfall. The threat for heavy rain will persist into Tuesday with nearly all of Acadiana remaining within a Moderate risk for excessive rainfall. 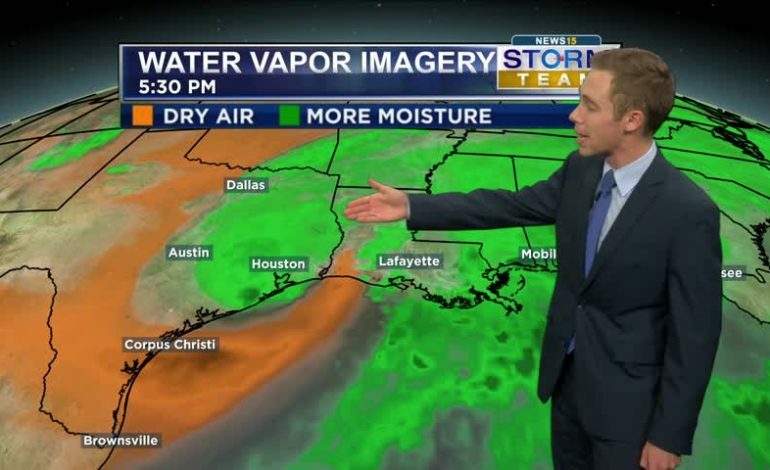 Plan for additional 6-10″ of rainfall across Acadiana through Thursday afternoon. Localized higher totals likely south of I-10, and the further west you go into southwest Louisiana. Some locations in Calcasieu, Cameron, & Jeff Davis Parishes could locally see an additional 15+ inches of rain before we’re all said and done with Harvey. High-Resolution forecast models indicate intermittent heavy rain bands will continue to build into Acadiana overnight tonight into tomorrow. Gusty winds, isolated tornado potential, and intermittent heavy rain will be possible likely within the rain bands. Localized 2-8+ inches of rain possible where the heaviest rain bands establish themselves. It won’t be raining non-stop, and there are signs that a “dry slot” may develop east of Harvey’s circulation. That slot of mid-upper level dry air may inhibit Harvey’s ability to develop consistent convection just east of the center. What does that mean? We have to possibility to see lower rain totals if that dry slot persists! Stay vigilant, stay prepared, and don’t get “tropical storm fatigue”! We’ve been talking about this system since it was a tropical wave near Africa over TWO WEEKS ago! Hard to believe Harvey is currently only ~150 miles from where it made landfall over 3 days ago. Talk about a slow moving system. Have a way to receive weather alerts & warnings if they are issued over the next several days. Elsewhere in the tropics, Potential Tropical Cyclone 10 may develop into Tropical Storm Irma off the coast of the Carolinas before rolling eastward out to sea. Potential for tropical storm conditions along with 3-6 inches of rain there over the next 36-48 hours. In addition, a vigorous tropical wave dubbed Invest 93L in the East Atlantic near the Cabo Verde Islands by western Africa has a high(80% ) chance of becoming a tropical depression or Tropical Storm Jose(or Irma if the system off the East coast fails to develop) within the next 3-5 days. Most models showcase this system moving steadily westward over the next 5 days, moving north of the Lesser Antilles in about 6-8 days. This system may be a threat to the U.S. in the long range, but it’s still 12-14 days away from ever reaching it. Something to monitor for now. A few forecast models also indicate we should keep an eye on the Bay of Campeche and the western Gulf of Mexico over the next 5-7 days for possible tropical development. Nothing imminent, but it is something to keep an eye on!